1. Add the chickpea penne pasta to a large pan of boiling water. Reduce to a simmer. Stir occasionally. Cook for 4-5 minutes maximum. Drain well, flash under cold water for a few seconds to stop cooking. Toss in a little olive oil to taste. Set aside. 2. Heat 1 tablespoon of coconut oil in a pan and fry the onion on a low heat until softened, not browned. Add garlic. 3. Increase the heat and add the tomatoes, purée and vegetable stock. Bring to the boil. Cover with a lid and reduce to a gentle simmer for 1.5 hours until rich and thickened, stirring occasionally. Ten minutes later, add some of the herbs and seasonings. 4. 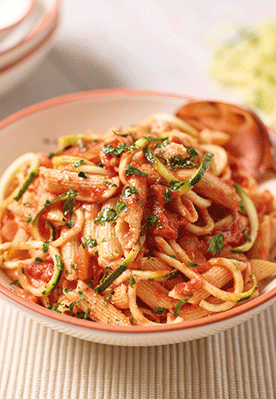 Spiralise or peel the courgettes into strips or strands. Into a pan, add a little water and heat the coconut oil. Allow the courgetti to wilt slightly. 5. Stir the parsley and bay leaves into the tomato sauce. Add a drizzle of extra virgin olive oil. 6. Stir the courgetti strands into the sauce. Mix in with the Chickpea Penne pasta. Serve.